A glamorous and beautiful, fully integrated, high specification contemporary villa for rental on the exclusive Kalafatis Beach in Mykonos, Greece. 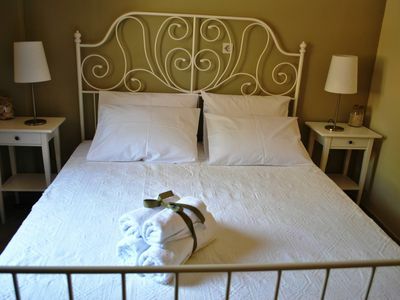 The luxury Property comprises six bedrooms and six bathrooms sleeping up to 14 Guests in total Comfort. 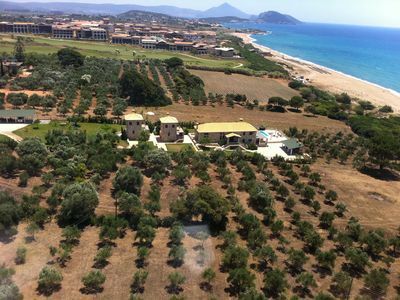 Set in its own landscaped grounds above the beaches of Kalafatis and Agia Anna only 200 meters distance from them. 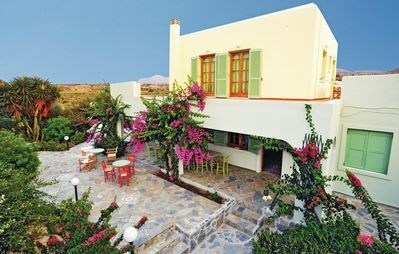 The beautifully interior designed villa has spectacular panoramic sea views across the azure Aegean Sea. The long sandy beach of Kalafatis lies at your feet, a fully serviced beach with tavernas the famous Italian restaurant “Bandana” and 3 water sports centers. Combined with the villa's private infinity pool you have summer aqua living at your fingertips! 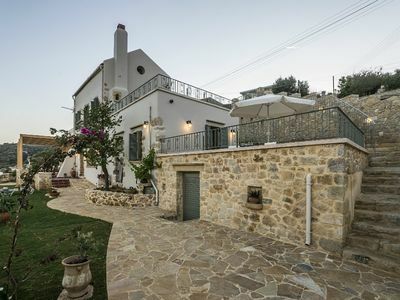 Wide terraces encircle the villa, step inside to a cool blend of soft pearly grey decor, contemporary furnishings complementing the tiled and polished cement floors and wooden furniture. 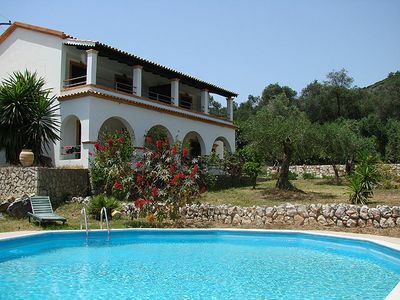 The villa is perfect for groups of friends or a large family, all rooms are fully accessible. Surrounding the villa the spacious gardens have been thoughtfully planned with plenty of private areas, shaded spots for when the sun gets too much, as well as shaded and sunny dining spaces to give flexible use of both the inside and outside areas whatever the weather. There are lots of luxurious and well thought out amenities and extras intended to make your stay as comfortable as possible: free wi-fi internet access, intelligent flat screen tv's in each room, en-suite bath and/or shower room for each of the bedrooms. 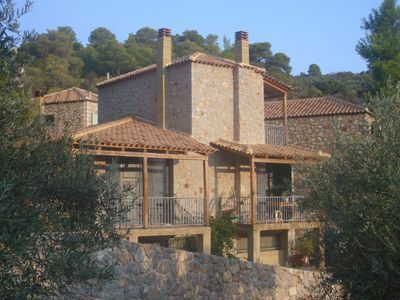 The villa has air conditioning, all bedrooms. The east wing of the villa consists of the large well-equipped kitchen and a stunning indoor dining room. 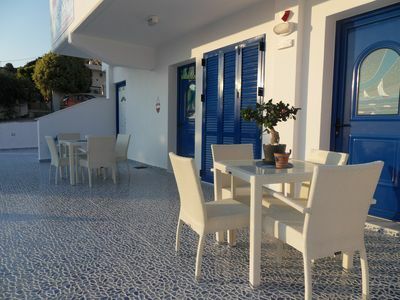 This, in turn, opens onto a further covered terrace dining area, as well as a large sun terrace, with further alfresco dining, seating, and sunbathing terracing and with superb panoramic views across the bay and out to sea. The large living, reception and dining rooms as well as the choice of many outside covered and open terraces, the pool area as well as the private garden, allow plenty of room for people to spread out and find their own privacy and peace and quiet, as well as being large enough for all guests to come together in total comfort. 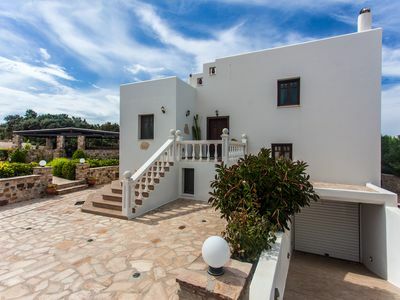 This luxury Mykonos villa to rent offers the very best in privacy, style, and luxury. One of the most luxurious and private rentals in Mykonos, Greece. 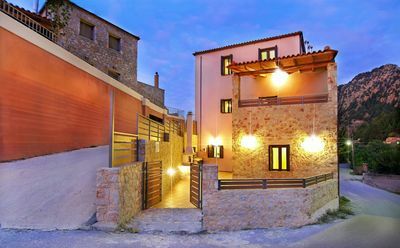 Elegantly split level and predominantly arranged, the Suites are airy and light with large windows and glazed double doors opening onto covered and uncovered terraces all independent, giving a combination of privacy and accessibility. Cool colored walls and floors add to this, and the contemporary furnishings blend beautifully, as do the contemporary mixture of dreamy Mediterranean colors. 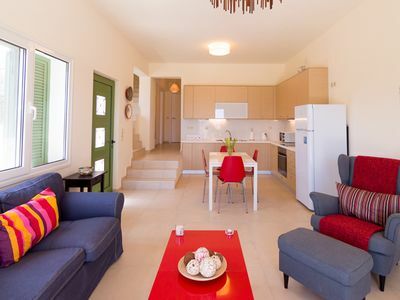 Every suite is from 30 to 45 sqm including kitchenette, bathroom, satellite tv available wi-fi. 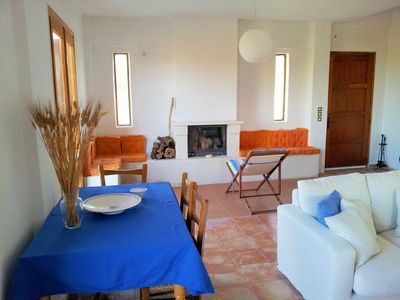 For luxury Mykonos Villa to rent, look no further. 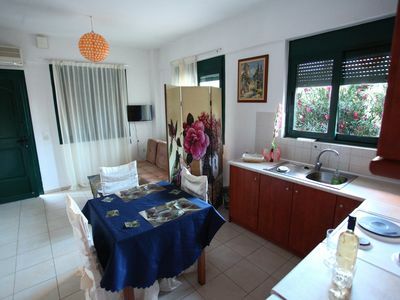 •	Private 350 sqm interior – 2.000sqm land. 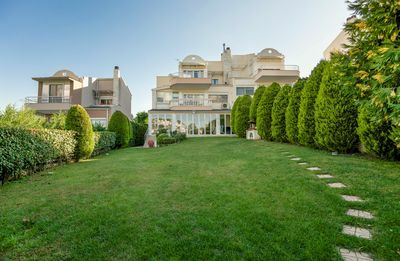 – 1.000sqm garden. 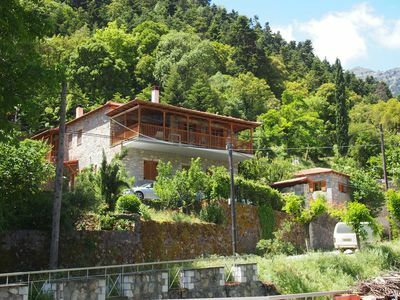 •	Only 200m distance from Agia Anna beach– Only 300m distance from Kalafatis beach – Only 500m distance from Kalo Livadi - 1000m distance from Elia beach – 1500m distance from Lia beach - 20min from the main town(Chora) – 15 min from the airport– 15 min from the port. •	Private 45 sqm (5x9) outdoor pool – shallow end 0.80m, deep end 2.80m. 1 Master suite with a King size bed (1,80m x 160m) with ensuite bathroom with sea view, its own private terrace, pergola, and small balcony. 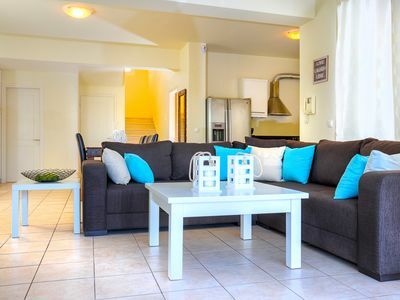 Family Friendly Villa inThessaloniki, with lots of amenities.